I got out a neglected, partially quilted project to try out a new size of the Dahlia template that we carry in the shop. It's a pretty striking batik panel in black and my favorite turquoise. I've been quilting on it with specialty templates by TopAnchor. We've had these rotating templates since the online shop first opened in the 9 and 12 inch sizes, but they recently released the new 6 inch size. I shot a video while I used this template on the Janome 8900QPCSE in my shop, Sew Simple of Lynchburg and it was the first time I used my regular camera mount in my new studio area. I still need to tweak the lighting and the mount itself. It was twisted off to the side a little bit. A note about videos: I was having trouble uploading the video without losing the quality. After getting quite frustrated and changing the file types, deleting and re-uploading, I discovered that my video quality settings had been changed with YouTube. This means YouTube was resizing (so to say) the video to a lesser quality. I love these rotating templates from TopAnchor! 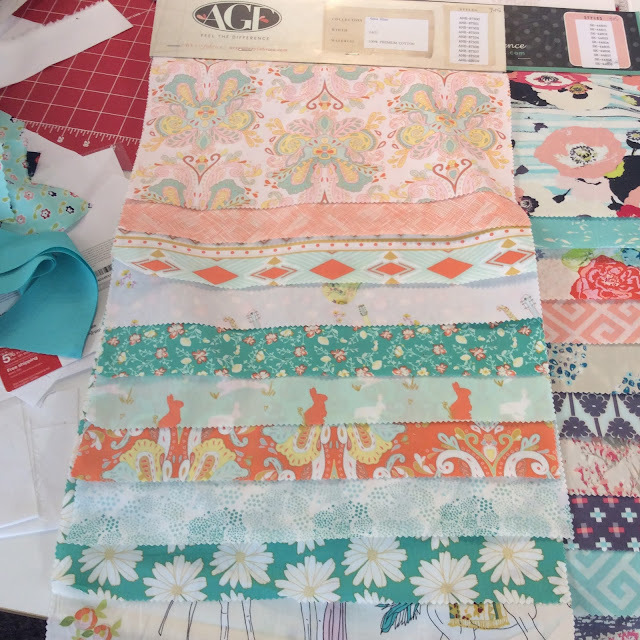 They make fabulous designs without marking, have very clear markings on the templates to keep you on track, and the patented anchor post is easy to insert as you do it from the top of the quilt. The only downside is that they are a full 1/4 inch thick so they are harder to use with a low-shank sewing machine. Not impossible, but definitely harder. Some of their templates are easier than others to position so they aren't behind the foot where there is little clearance. With the addition of this new size dahlia template and the Celtic Knot templates from TopAnchor several months ago, I want to finish up this project since I'm starting to feel the burden of being overloaded with unfinished projects. So many ideas, so little time! Happy Sunday! I love Sundays lately. A little later time to wake up, church service, extra time with the family and no going to my shop. Yes, I am happy to not go to my shop. All work and no play and all that jazz. Six days a week is plenty. But I do love it. We're still seeking a routine and definitely working too late each night, but things are starting to come together. I shot this video below a few weeks ago and wasn't sure I'd post it since it features me, but I got over myself and decided to post it. Nothing fancy and the shop is a diamond in the rough, but it's come a long way and is starting to feel like my own place. It's not much, but it's a great opportunity to serve the sewing community in my area and have a place for me to work as well as my husband. He's been working on machines and they come in the door as fast as we get them out! This is a total blessing because his job has been rather shaky for quite some time and as we got going with the shop, his boss's business pretty much shut down! Big hugs to you and I better sign off before six days become seven! 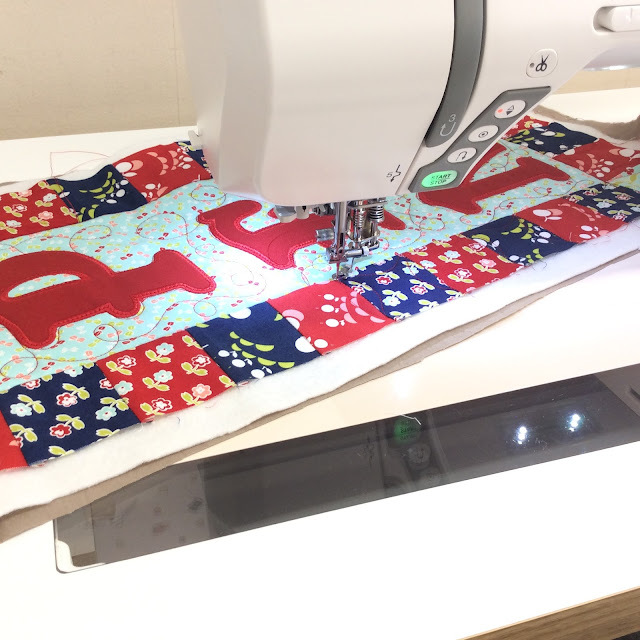 Big beautiful Bernina news! I don't know details, but educators from all over the US are at Bernina University this week and one just posted this picture of the new Bernina approved, official ruler foot for the domestic Bernina machines. Now you can do ruler work on your Bernina and talk about it with your Bernina dealer without getting the stink-eye. More details to come. I hope you had an excellent Independence Day if you are an American or live in the States last week. We're heading into the weekend again and I did actually stitch a bit this week. 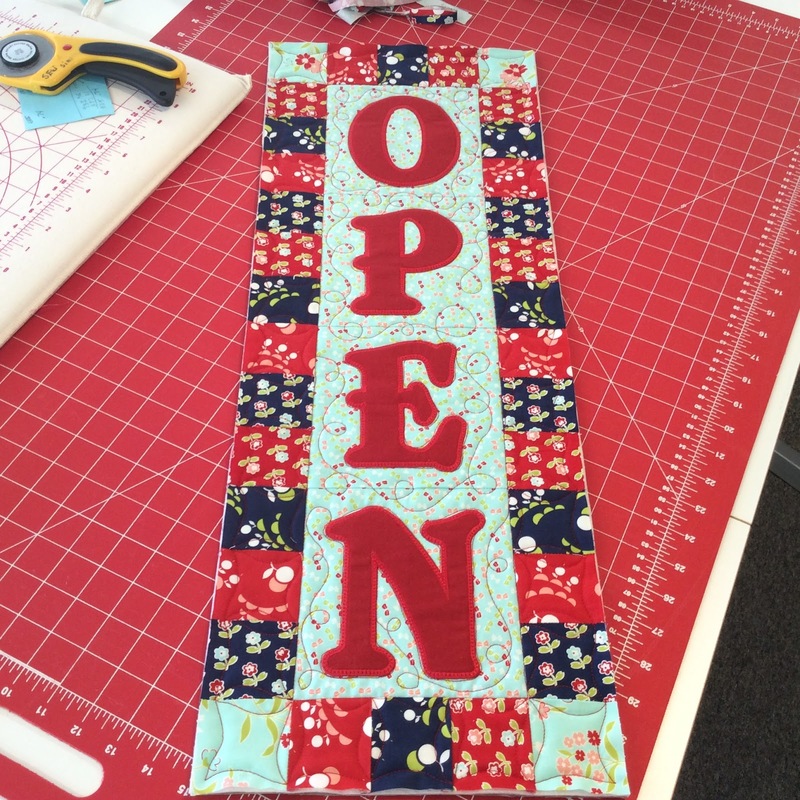 If you ever thought it would be fabulous to own a quilt shop or similar shop and sew or fondle fabric all the time, let me tell you, that's not the case. There's bookkeeping, prepping product for sale, answering the phone, and plenty of things in between to keep you from sewing. Plus all of my wonderful customers! But there is a fabulous selection of machines to choose from when I do get a minute to stitch and I've got a ton of ideas for samples I want to stitch up. I've got to tell you I've got a new favorite machine for piecing. The new Janome 9400 has got a new foot and needleplate just for piecing a great 1/4 inch seam. So much room to work! Plus plenty of light. It's taking a while to get used to it as it's got an automatic electronic presser foot lifter and a bobbin thread sensor which means I don't even have to put the foot down to sew and it will warn me if I'm running out of bobbin thread long before I do my usual stitch for 24 inches of nothing. Can you see the foot is slightly raised here while I use the auto pivot feature? Perfect for easing in this curve. It pieces a great quarter inch seam (supposedly a scant 1/4 inch, but I'm not precise enough in my piecing to accurately tell at this point) in the left needle position. The service guys tell me that this is an optimum position for the best stitch formation. The foot is narrow too without a fence/flange/guide along the edge and I figured it would be perfect for curved piecing, especially with its auto-pivot feature. Nice curved seams and no pins! Yay! 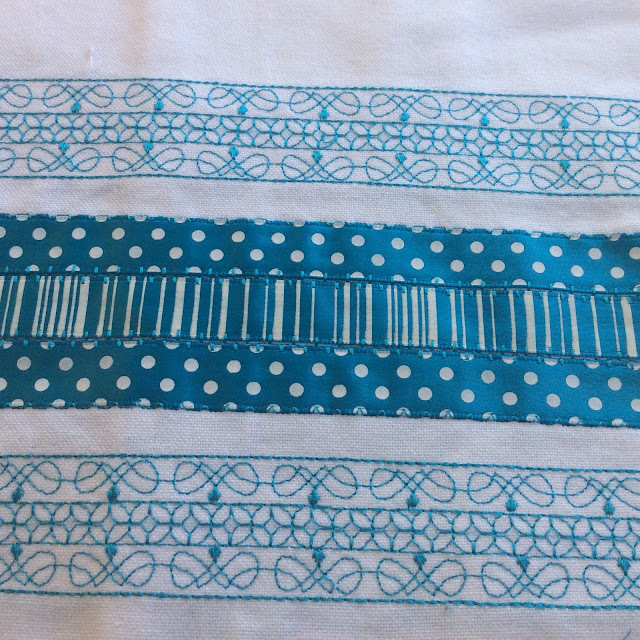 I finally got out my Quick Curve Ruler by the gals at Sew Kind of Wonderful and am so glad to finally be working on one of their great designs. If you've ever seen their Instagram feeds, you've seen the gorgeous quilting that they do with rulers on their quilts. They do it with a long arm, but of course we can do the same kind of quilting on our regular machines. 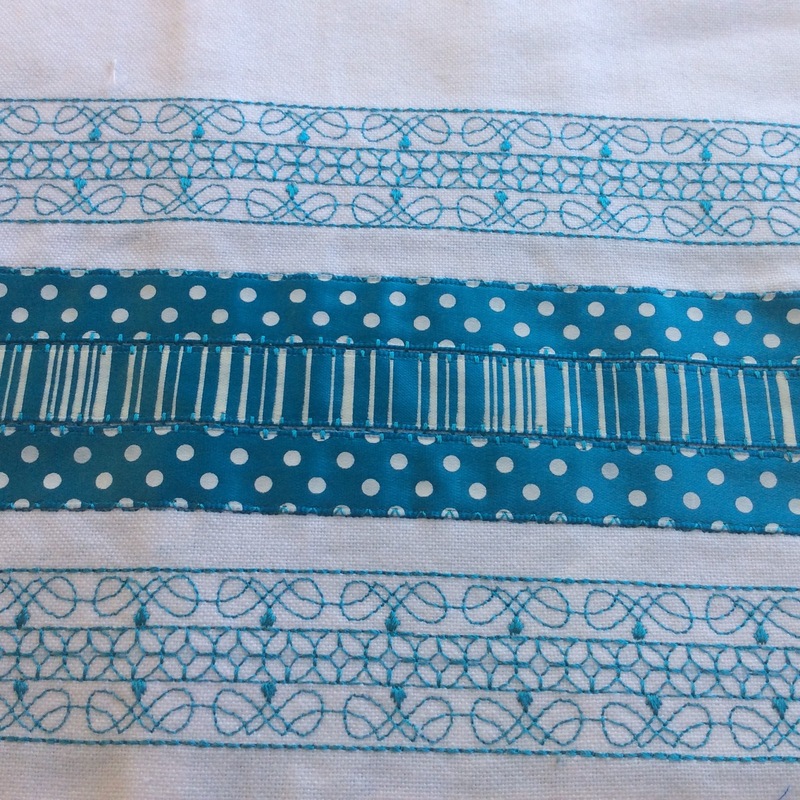 If you're not sure how, have you checked out my classes on quilting with rulers at Craftsy? See my classes and get them at 50% off all the time by clicking on my instructor's affiliate link. Let's hope I actually finish this table runner up instead of putting it in the pile of UFO's that's getting to a shamefully large size. I'm still trying to get settled into the shop as a studio as well as dealing with the relocation of my quilting area at home. 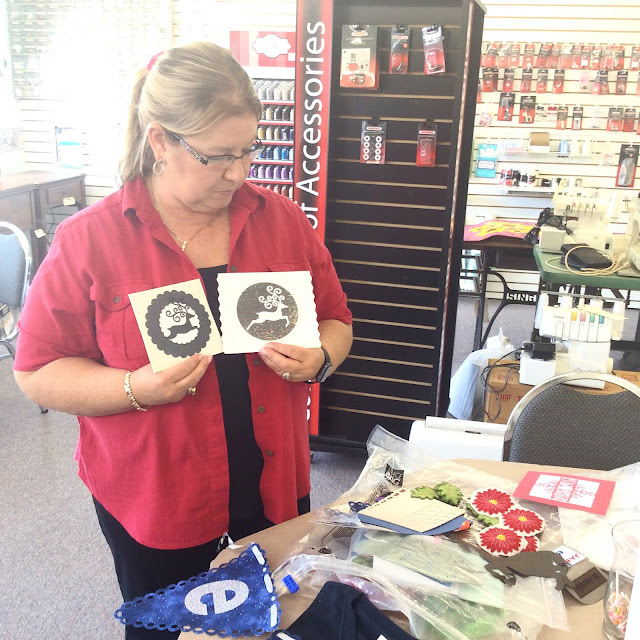 I used the shop's Artistic Edge cutter to make new signage for the shop's windows too. This thing is really addictive! I had an inkling that it was probably ill-advised to do your own window signs, but they turned out really well. I still have a few more things to add to the windows including a "Home of Amy's Quilting Adventures" line but things are really shaping up. 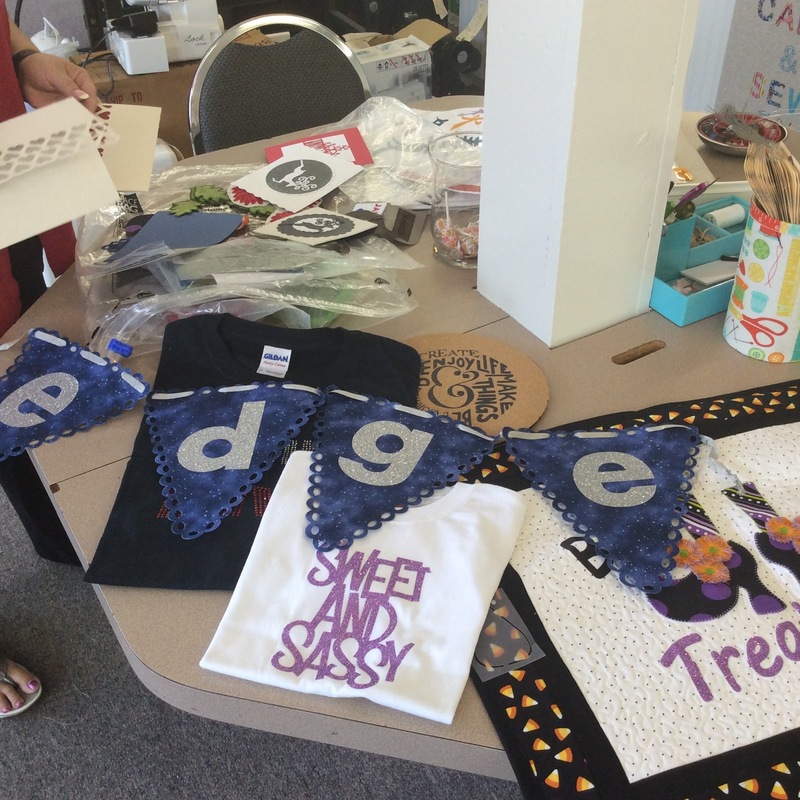 I mentioned my Craftsy classes above, but I would be remiss if I didn't tell you that Craftsy's got another hot sale this weekend on all classes. Click here to see the great deals. That's an affiliate link which helps keep me doing all that I do. I bet y'all are wondering if the 9400 is my new go-to machine for free motion quilting. The jury is still out on that. With the automatic presser foot lifter and my addiction to the Janome ruler foot, I would probably say I prefer the 8900 for FMQ. (See my video of the ruler foot and the auto presser foot lift on the Skyline 7 for more) Of course my view is skewed since I have the option of a bunch of Janome machines to choose from now. 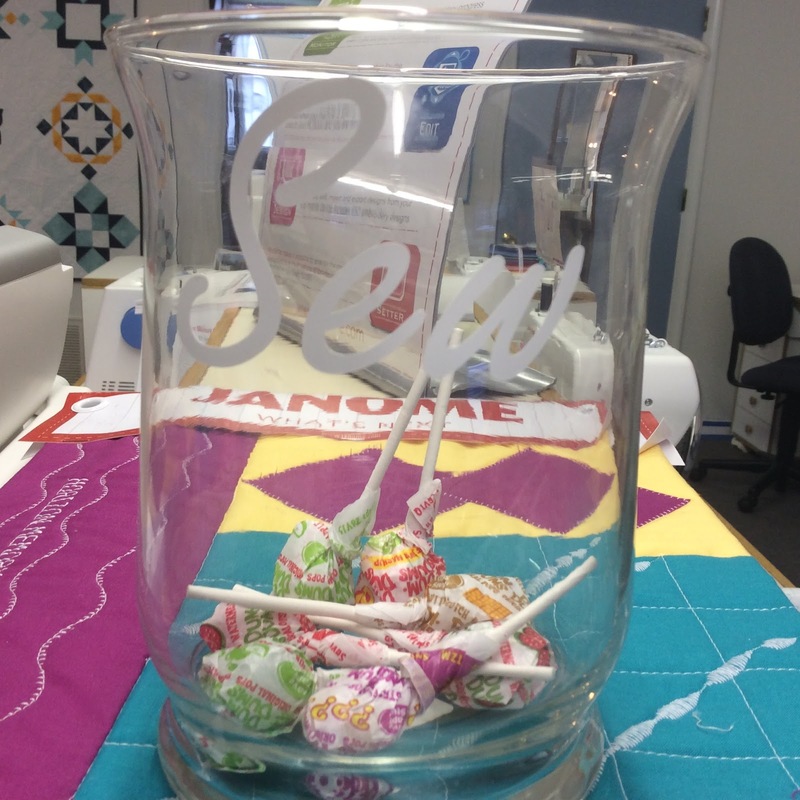 Come visit me at Sew Simple of Lynchburg if you find yourself in central Virginia. 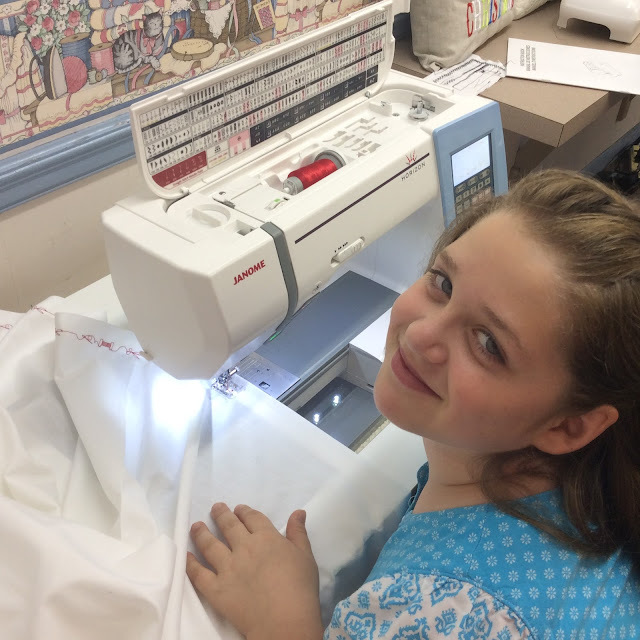 Family, Fabrics, and Machines, Oh My! Here we are heading into the 4th of July weekend and my little family is all back together. 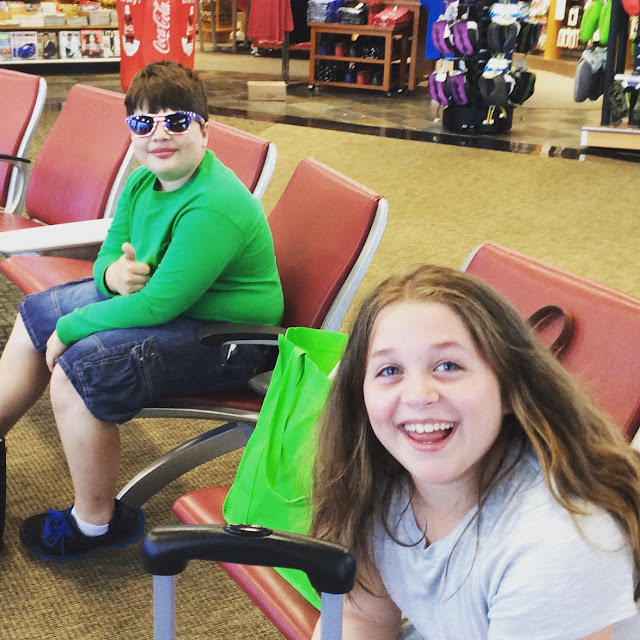 These two knuckleheads came back from Colorado and their first plane trip. 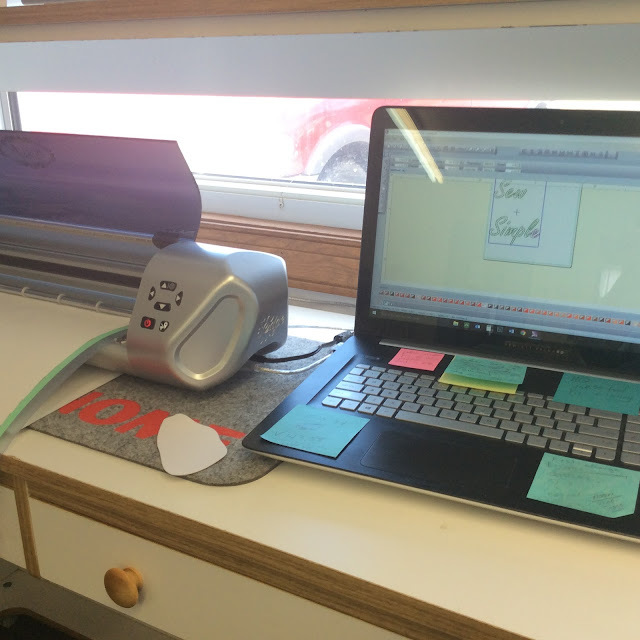 Leah made herself comfortable at the shop right away and stitched up a curtain for a back window on our Janome 8900QPC SE. 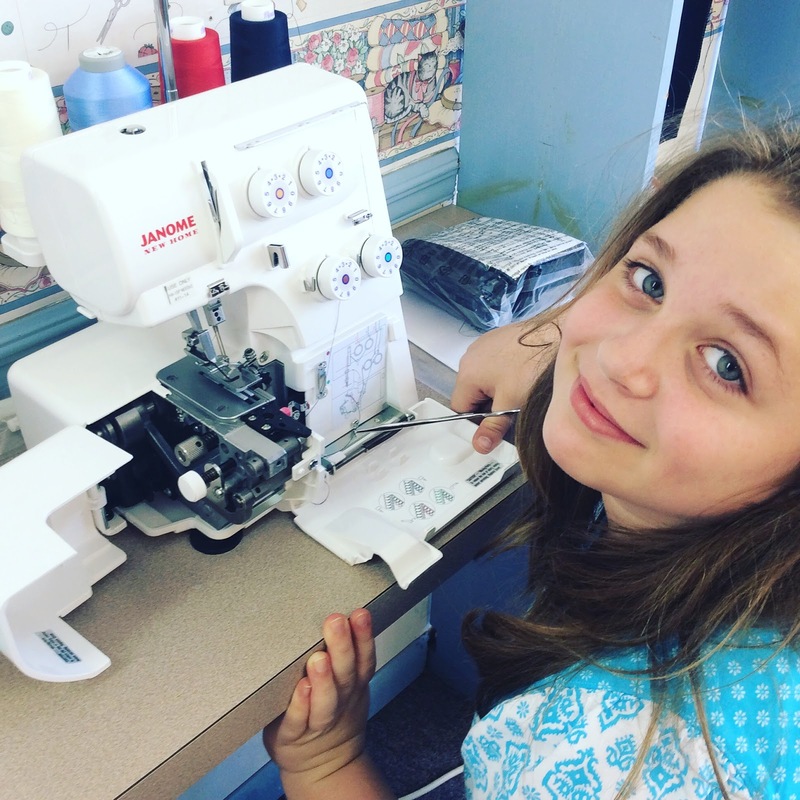 Then she threaded this serger nearly all by herself. "I just followed the pictures!" Now if I could just get her to follow a pattern. She seems set on stitching and cutting fabric into smaller and smaller bits. 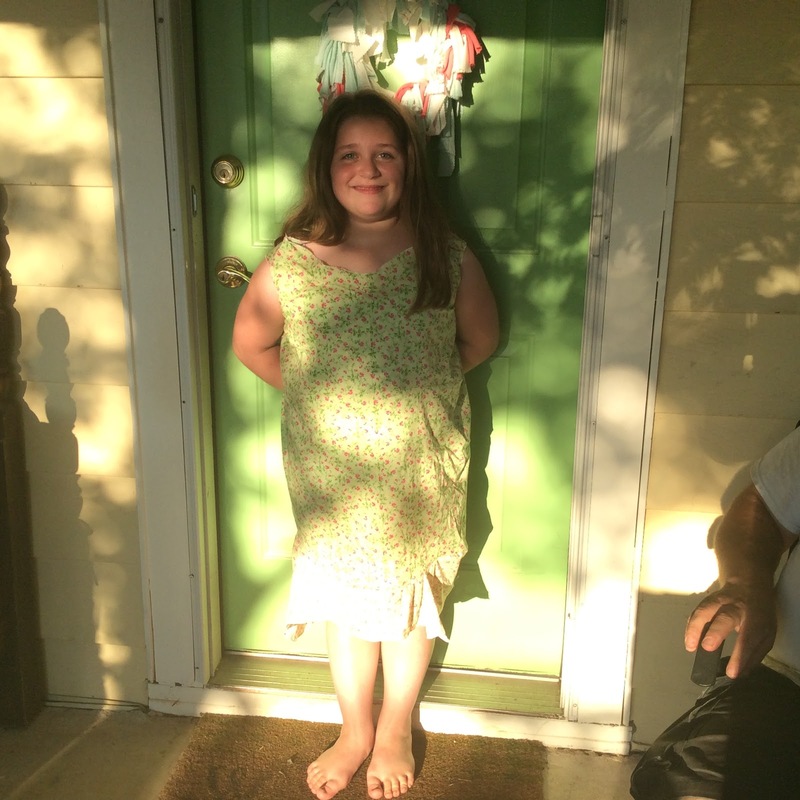 Then at home she stitched up this dress. No pattern at all. I ended up helping with the arm and neck holes just a bit. It's wonky as all get-out, and she wants to wear it to church. I'm proud of her creativity, but I'm not sure of the reception it will get. Think it's time I sit her down for a simple skirt making session and basic pattern following 101. She really hates following a pattern (gets it from yours truly) but I'd really like her to make what she actually sets out to make. We've had some pretty fabulous visitors to the shop this week. 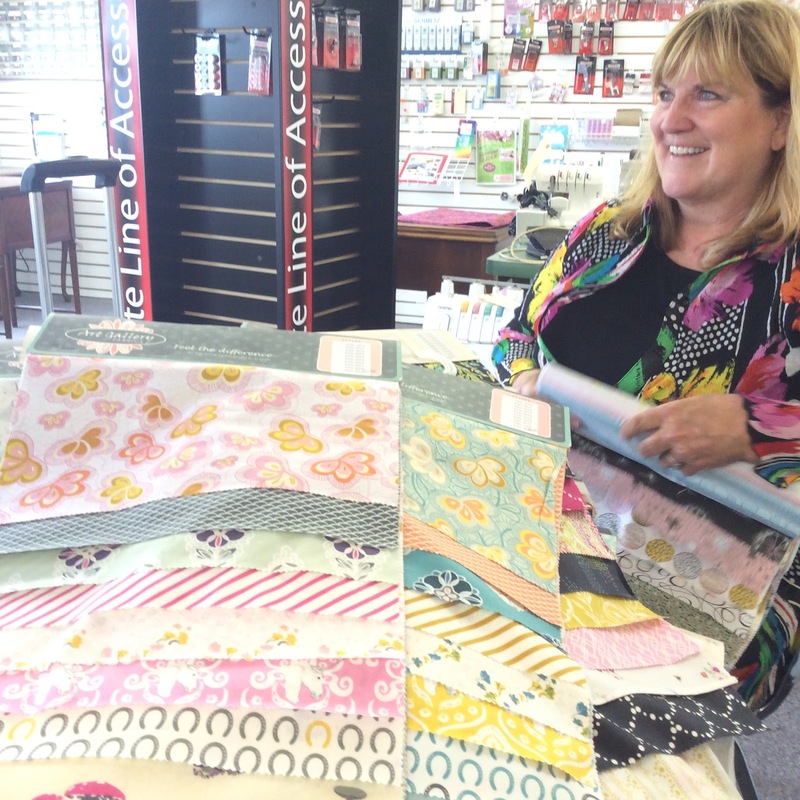 First was Kim, my regional rep for one of our parts distributors AND wouldn't you know it, a fabric rep for a few companies, including one of my favorites, Art Gallery Fabrics. A true trouble-maker, I tell ya! OK, only because it's very hard to say no to beautiful fabrics.....for now. Mmmmm......look at these pretties! So many fabrics. The brain is running on overload. We will eventually dabble in some fabrics, but these changes take time to happen. The shop was in need of a new 'open' sign to go along with the new bunting on the awning. I had fun stitching the letters with machine embroidery applique. This could become a new passion. It certainly can help me create fmq-worthy tops faster. I'm not sure what inspired me to use red thread in the turquoise background. Let's just call it a bold design choice. I didn't snap a pic of the finished sign yet. Then I got to spend 3 days at the shop with LuAnn Hartley. She wasn't too keen on having her picture taken, but had a ton of inspiring samples to show me. That display behind her is now crammed full of machine feet. Though the shop's AC started to go during her visit (thankfully, was replaced Thursday), we had a good time learning about the various machines and especially about the digitizing software, digital cutter and software, and the features of some of the newer machines, software, and embroidery machines. Since I already have a good knowledge of Janome's machines, we were able to focus on the few areas I was lacking knowledge in and she shared some real gems about running a good shop. She walked me through some problems I had with my Artistic 15. Silly me, I skipped the all-important calibration of the laser. This thing is pretty amazing! I see more applique in my future. The included software even creates the embroidery file to stitch the cut fabric shape down. 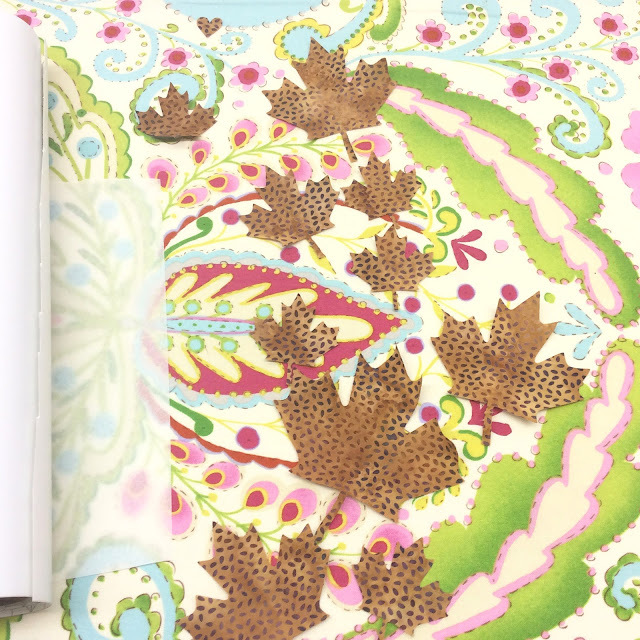 I made a bunch of maple leaves first. Then I tried my hand at adhesive vinyl. Guess who will be trying her hand at new signage on the front windows? Yep, me. If I were learning to quilt these days, I'd be the kind to start with a king-sized double wedding ring. 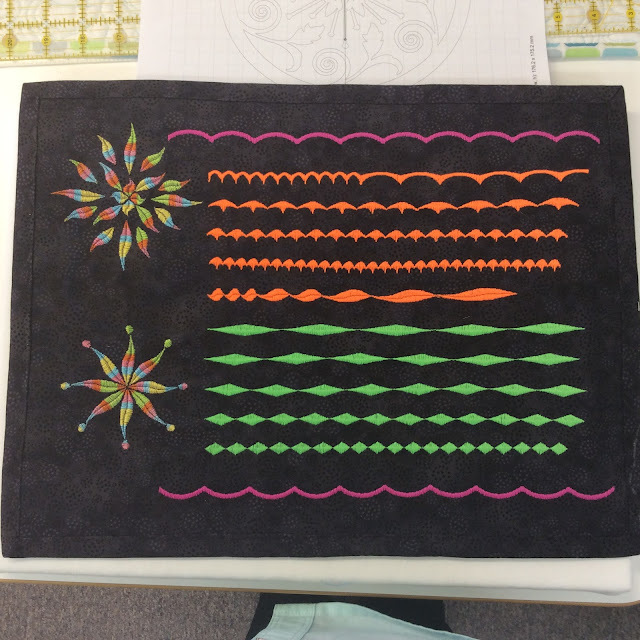 LuAnn also had some inspiring projects using decorative stitches. Three rows of stitches look like lace on this tea towel. Have you ever tried the elongation feature on your machine? The flowers below were done using decorative satin stitches and the elongation feature. It looks like machine embroidery, but isn't. That's all I have for now. I'm so very tickled with this path God has put me on. It's been quite a journey and it feels like I'm just getting started. I'm also exhausted! Goodnight y'all!